And that's it ... thank you again to Amy for writing this story - it was a fab script, and I had a great time illustrating it! I'm really pleased with how things have gone so far - there were some skipped weeks, but on the whole I managed to get the pages done pretty regularly and didn't keel over in the process. So experiment 'Can I Still Make Comics With Two Kids?' seems largely successful. That said ... I am now going to be taking a rather long break - until January 18th, in fact. 1) I need to write the script and do the thumbnails for the next story (I have a story I very much want to do, but none of it is on paper yet). 2) I would like to be in the next Spiderforest Anthology, so I'll be working on a (very) short story for that, as well. 3) CHRISTMAS CHRISTMAS CHRISTMAS ... especially with the kids, I find getting the comic done over the Christmas period a real challenge, as there are so many other things that need doing in the evenings. So this year, I'm not even going to make the attempt - Christmas is stressful enough without thinking 'I should be drawing that panel with the weird perspective' while writing six billion Christmas cards. 4) I need a break. I no longer have the energy to produce a page a week all year round, so I intend to take breaks between every story from now on - the goal being that then I will be able to update reasonably consistently when a story is underway. Probably won't be as long a break next time though, uuuuunnnnnless it coincides with Christmas again ... .__. 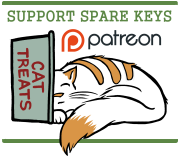 I'm planning to put up monthly progress updates and maybe link a few comics I'm liking at the moment, just to let you guys know that I'm still alive, but otherwise, I will see you in January with a new Spare Keys story! 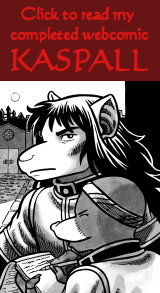 Obscurato: Retired warrior Dionisia's quiet life as a grandmother is interrupted when an old friend is in need of saving. With her past catching up to her she is about to discover just how magic left her world, and have to decide if it is worth bringing back. Beneath the Clouds: Genza, a exiled nobleman- turned-monk, is offered a chance to redeem himself by undertaking a perilous journey to Heian Kyo. Will Genza be prepared to confront his own demons in order to save the life of the man who exiled him, will his daughter Masako make a new life for herself in the city, and does a stranger met on the road offer a chance for a new way forward? Hex Lovers (NSFW): A comedic tale of romance, depression and magic users! Follow the adventures of Blue Wizard and Hex Witch as they survive dungeons, goblins, and long term relationships! Along the way they will encounter both friend, foe and ex-boyfriends.